Welcome to the Tall Mom 1,000+++ Club, for those who strive to Run 1,000 and BEYOND in 2011. 1. Run, walk, swim, shuffle, or crawl 1,000 Miles or more+++ in 2010! Miles by the power of your feet (or full body for swimming). Maybe you do not believe you can make 1,000 miles?? That is OK, sign up anyway everyone is welcome!!! Those of you Triathletes please come up with an equivalent you are happy with for bike miles and record as you see fit. 2. Keep track of your mileage, shortly after you sign up you will get a link to the shared spreadsheet. Be sure to keep your miles updated because there will be Check In Posts on Tall Mom every quarter. Also those who are close to their Goal will get extra entries into Tall Mom Giveaways. 3. Post the Club logo (Above) with a link to this Post somewhere on your Blog. If you do not have a Blog be sure to let people know you are taking on this challenge so they WILL cheer you on as you go. 4. 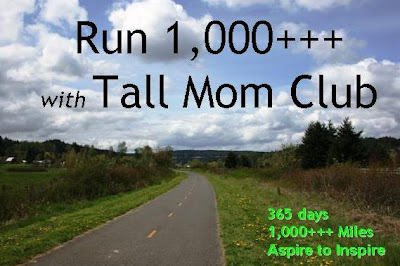 Make it to your goal by January 1, 2012 and you will get recognition on Tall Mom with extra incentives as we go..
**Maybe your goal is not 1,000, it may be less or more.. The Math is the same, just insert your number and calculate. It is VERY IMPORTANT to know your weekly/monthly mileage Goal to stay on track. ***2010 Members if you have not recently received an email for the 1,000+++ club then I do not have your correct email address. Please email me again so I can update my information for you. If you want out please let me know ASAP..
AND OFF WE GO+++ I was TRULY amazed by the number of people who joined in the Fun in 2010. Many people went 1,000+++.. Here are a few tips to make it to your Goal. 1. Tell friends, family, co-workers, etc. about your Goal. Getting the people in your life involved with your Goal is a great way to stay motivated and accountable. Joining a mileage tracking website like Dailymile.com is a fun way to keep track of your miles and meet local runners. 2. Look at the race/fun run calendar and register for some races. Google training plans to prepare for that race...PRINT THE PLAN AND PUT IT ON YOUR FRIDGE. Repeat this step throughout the year. Having events to prepare for and stay in shape for truly helps! 3. Determine incentives.. Personal Goals with rewards is a great way to keep those miles going. For Example, at 100 miles I will get a manicure or indulge in a bowl of ice cream.. The incentives are yours to decide. 4. Get the Gear!! I cannot stress enough how important good gear is to comfortable and injury free miles. Shoes are #1, get fitted at a local running store if you have not done so. Also on the top items to buy list are running socks= NO COTTON. Body glide, yes we all use it. And gear for all weather conditions, rain, snow, heat, etc... Be Prepared, don't let not having the right gear keep you from running. 5. Make it FUN!! Join local running clubs, make friends, follow the Bloggy Journeys of the other club members and remember you are NOT ALONE!! As Brooks Running says "Run Happy." you're amazing...signing up! P.S. we really need to work on that assistant thing! I'll send you an email after I decided! Finally emailed you- woo hoo! I'm am stoked to be joining you on this this year. Whoohooo! I worried I may not get enough miles in but what the heck, I'll go for it anyway. I will send you an email later today! I'd love to do this! I will send an email when I get a chance. Thanks for organizing this, it sounds like fun and a good way to reach some goals for the year! I'm in - just emailed you!! Looking forward to trying to reach this goal and cheering everyone else on! Thanks Mel! So excited that I get to be a part of this!! Will email you this afternoon! Off to run with a friend to try and get in a tempo before the snow starts to fall... :) 1250 miles planned this year - that's 2011 km! this is great...i can't wait to cheer everyone on! good luck to all!!! I do think it is great that SO many people are making and achieving such great goals...especially being active! You are on top of things in 2011! Nice job. I am looking forward to another great year of whatever life brings. I'd love to give it a try! Yea! Just sent the email. Hope I made it in the group. Didn't come close to a 1000 last year but it was a good goal to strive for so count me in. In the first rule you wrote 2010. I'm definitely in! I don't know if I'll reach 1000 or not, but I want to come close! Can't wait to feel this goal getting close! GOOD LUCK everyone. I'm game for another year! I sent you a reply to one of your 2010 e-mails letting you know. So excited to make this happen! I'm going to send off my email now! Anyone have input about a good ratio in regards to an indoor bike vs. running? 1:3, 1:4, 1:5?? Yah! This sounds like so much fun! 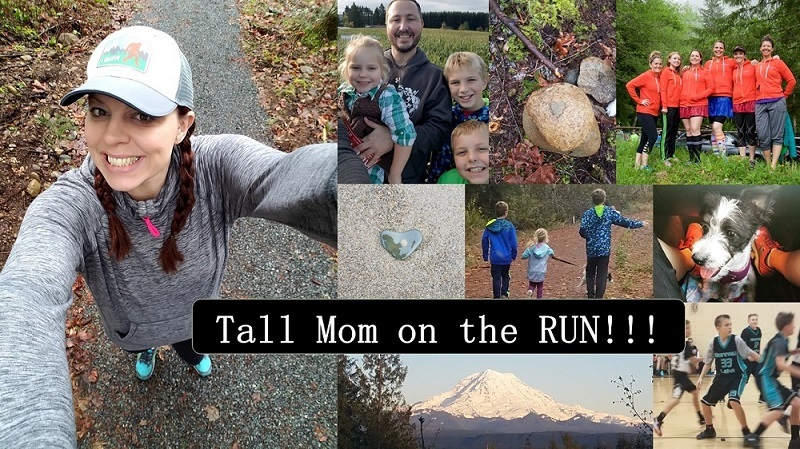 I'll be a short mom on the run! I'm a repeat from last year but I am in!! Ok, I know it's mid-April, but is it too late to join? If not, I'll just support this year and remember for next year. Great blog! I know I am super late but can I still join? Just found your blog today. Count me in! I want to be a 1,000'er too!